Look up in the night sky, if you are lucky you might be able to see Vesta, the only asteroid—among millions that lurk between Mars and Jupiter—bright enough to be visible to the naked eye from the Earth. Given their dull (non)appearance in the sky, it is no wonder that the first asteroid was only discovered in 1801 when relatively powerful telescopes started to be built. However, in the two centuries since, we have learnt a lot about these celestial bodies. They could prove to be both a curse and a blessing. A curse because they could bring about the end of human existence, and a blessing because they could be the launchpad for building human colonies in outer space. The definition of an asteroid has changed over the years, but today we know them as small bodies found in the inner solar system. Asteroids can also be called failed planetesimals—tiny fragments that had the potential to grow larger under the influence of gravity and become a planet when the solar system was being formed billions of years ago, but couldn’t. We now know that these “failures” pose a high risk to life on the Earth. Only last week a half-kilometre wide asteroid passed by the Earth. If it had hit us, it could have caused human extinction. Fortunately it was about 1 million km away, which is three times the distance between the Earth and the moon. But the risk is real. In the past one such asteroid impact was responsible for extinction of dinosaurs and an older one caused even more destruction and made all the oceans boil. The good news is that, with enough warning, we already have the technology to deflect asteroids. But the bad news is that we may not get enough warning, because there are thousands of asteroids—some of which could be on a collision course with the Earth right now—that we have not yet discovered. This threat has spurred some to take matters in their hands, rather than wait for government agencies to do the work. The B612 foundation, for instance, is planning to launch a private space mission in 2018 that will discover and track hundreds of thousands of such asteroids. Leaving the stories of doom behind, asteroids are fascinating for another reason: they hold clues about the formation of our solar system. For instance, according to theory, when the Earth formed into a planet, the process would have been too hot to have left any liquid water on the surface. So the current hypothesis is that water-rich celestial bodies, such as comets, brought the water when many crashed into the Earth during its early days. A current space mission, called Rosetta, to the comet 67P recently tested this hypothesis. It found that the water on that comet was not of the same composition as that on the Earth. So if not comets, then the other celestial body that could achieve this feat are asteroids. This hypothesis will be tested by the Hayabusa-2 mission, launched in December by the Japanese space agency, when it will land three rovers on the asteroid 1999 JU3, and also collect and return a sample from the asteroid back to the Earth in 2020. Even if they aren’t the source of terrestrial water, asteroids could be habitable, or at least resource-providing, stations for human colonies in outer space. And this isn’t just a crazy idea. Two private companies, Planetary Resources and Deep Space Industries, are currently working on projects to mine asteroids. They aim to harvest not just water, but also metals such as iron, nickel, platinum and palladium. Apart from the moon, few celestial bodies can boast of having such a close relationship with humanity. First published in Lokmat Times. Lead image by ESA and ATG media lab. 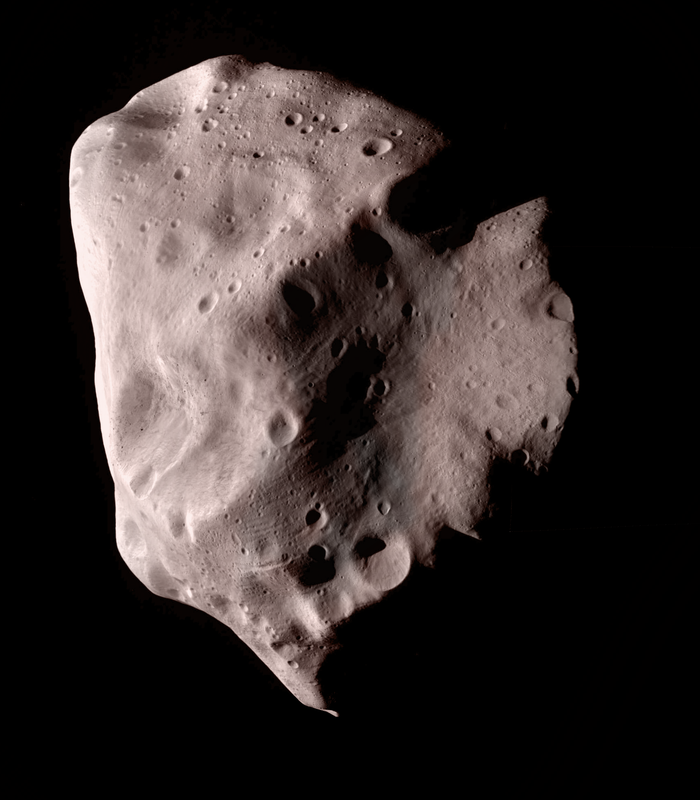 Asteroid image by Emily Lakdawalla (under CC-BY-NC-SA).